The first category is about preventing disease, staying physically and mentally fit, longevity, building good body image, doing sport, socializing and having fun, which is where we are focused today. Just about all of the benefits on this list are supported by some scientific study by health or fitness professionals or decades of practical experience—or else are just plain obvious. Preventive health and the maintenance of a healthy lifestyle and body image are the core concepts in this category. Some people get such self-esteem and confidence out of bodybuilding, shaping and toning, and powerlifting that many of the other benefits are almost secondary for them. It becomes a way of life and a satisfying one at that. Try these Top 10 Exercises. You know about this one. Exercise of 30-60 minutes each day helps to keep weight in check, especially if combined with a healthy, energy-neutral diet. Weight training is an essential part of the mix, enhancing muscle strength, tone, and bulk while contributing to an efficient metabolism. As you gain strength, joints and muscles work more efficiently together to increase your overall functionality in areas such as balance, flexibility, stamina and injury prevention. Weight training is heralding a revolution in the maintenance of functionality into older age; the muscle mass decline and the unsteadiness that goes with aging may not be as inevitable as once thought. Did you know that losing weight by calorie restriction alone can produce a decline in bone mass and density? Weight training is the ideal companion for any weight loss program because it helps maintain bone density while you're dropping the excess fat. Muscle building and impact exercise strengthens bone when muscle and tendons interact with the bone at the attachment points, producing growth stimulation. It sounds a little too good to be true, doesn't it, improving all these things with weight training? But think about this. Regular exercise tends to improves sleep patterns; that's no revelation. Moderate exercise and good sleep both enhance immune function. Put it all together with weight training and you have an extremely effective promoter of better health in all of these interconnected areas. "Wellness" is a catch-phrase for good health and being fit, energetic and resistant to disease. 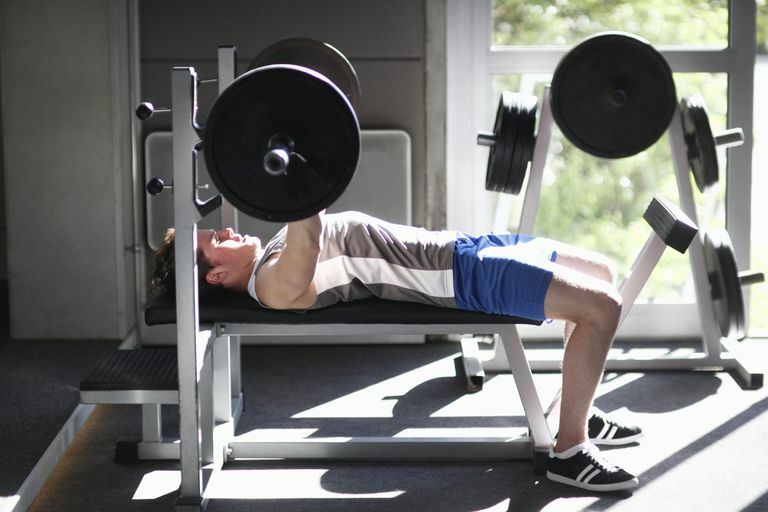 Regular, progressive weight training as part of an exercise ethic can improve your self-esteem, confidence and may help to prevent or even remedy depression. Want to learn about the benefit of weight training for chronic health conditions? Be sure to check out The Benefits of Weight Training for Chronic Health Conditions. Singh NA, Clements KM, Fiatarone MA. A randomized controlled trial of the effect of exercise on sleep. Sleep. 1997 Feb;20(2):95-101. McCartney N. Role of resistance training in heart disease. Med Sci Sports Exerc. 1998 Oct;30(10 Suppl):S396-402. Review. Quist M, Rorth M, Zacho M, et al. High-intensity resistance and cardiovascular training improve physical capacity in cancer patients undergoing chemotherapy. Scand J Med Sci Sports. 2006 Oct;16(5):349-57. Singh NA, Stavrinos TM, Scarbek Y, et al. A randomized controlled trial of high versus low intensity weight training versus general practitioner care for clinical depression in older adults. J Gerontol A Biol Sci Med Sci. 2005 Jun;60(6):768-76. Castaneda C, Layne JE, Munoz-Orians L, et al. A randomized controlled trial of resistance exercise training to improve glycemic control in older adults with type 2 diabetes. Diabetes Care. 2002 Dec;25(12):2335-41. Layne JE, Nelson ME. The effects of progressive resistance training on bone density: a review. Med Sci Sports Exerc. 1999 Jan;31(1):25-30. Review. Panton LB, Golden J, Broeder CE, et al. The effects of resistance training on functional outcomes in patients with chronic obstructive pulmonary disease. Eur J Appl Physiol. 2004 Apr;91(4):443-9. Dibble LE, Hale TF, Marcus RL, et al. High-intensity resistance training amplifies muscle hypertrophy and functional gains in persons with Parkinson's disease. Mov Disord. 2006 Sep;21(9):1444-52. Kettunen JA, Kujala UM. Exercise therapy for people with rheumatoid arthritis and osteoarthritis. Scand J Med Sci Sports. 2004 Jun;14(3):138-42. Review. Lakka TA, Laaksonen DE. Physical activity in prevention and treatment of the metabolic syndrome. Appl Physiol Nutr Metab. 2007 Feb;32(1):76-88. Review.